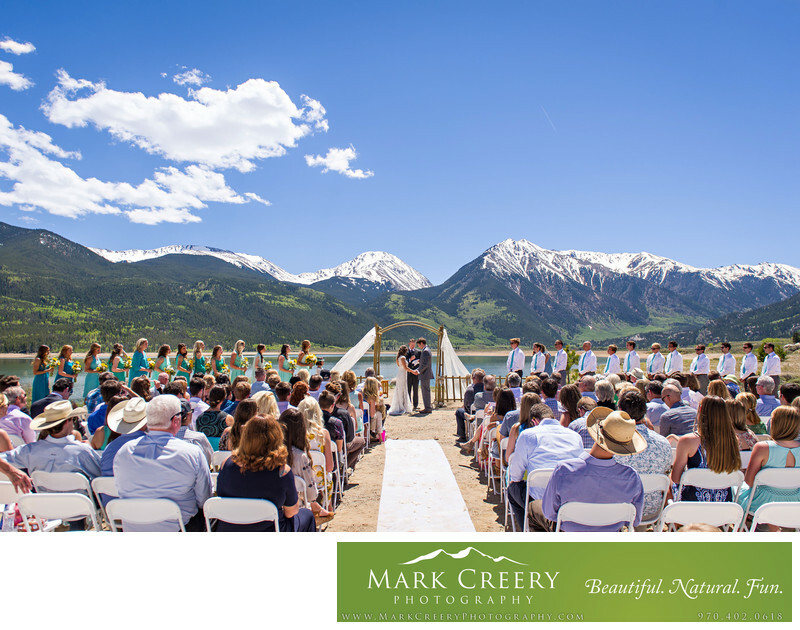 Twin Lakes is a hallmark Colorado wedding ceremony location that is a photographer's dream. In the summer, the colors are so vibrant - the deep blues of the sky and lake, the different shades of green on the mountains and forest everywhere around you, and the white of the still snow-capped peaks in June. This wedding photo shows off all of that and gives you the guest-eye view of how the ceremony appeared to them. The couple had a large wedding party which stretched out far to the side of the aisle - 13 bridesmaids and 12 groomsmen! The reason there were so many is that most of them worked at Noah's Ark, a rafting adventure company based in Buena Vista that rafts on Arkansas River. It is a tight-nit community that sticks together, even after the couple moved to Arkansas State. The bride has a passion for life, and showed off her personal style by wearing her baby blue Nike sneakers. Comfort wins over fashion in my books, but I'm a man. After the ceremony we went into Buena Vista for some more bridal party and couple photos along the river, before heading to the reception. The whole bridal party got transported in a long school bus used for rafting. Twin Lakes is located near Leadville, Colorado. Location: Twin Lakes, Lake County, Colorado 81251.